There are many items that you can use to represent your Feng Shui Wealth goals, here are some great examples for you. Something that represents wealth to you, like your first paycheck, is a personal Feng Shui wealth symbol. Place that personal item in your wealth area (when looking in from the front door it is the back left corner of any home or room) to attract more money to you. Items that are purple, gold, and green all symbolize wealth. You do not have to paint your wealth area one of those colors, but you might choose to include one of those colors in your décor. 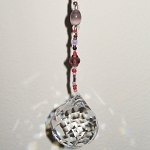 Our Swarovski Wealth and Prosperity Hanging Crystal includes purple and gold beads to increase your wealth energy. It also has amethyst for wealth and wealth intentions. Chinese Coins (Imperial Coins, round with square hole in center, also called Feng Shui Coins or I-Ching Coins), both authentic and replicas, are an excellent symbol of wealth, prosperity, and security. Ancient Key shaped coins, and Bagua shaped coins (which were used as amulets) also attract money to you. 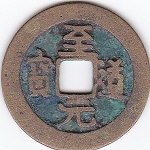 You can buy Chinese Coins individually, on hangers or bells, or inside a red envelope or brocade purse. Another effective use for Chinese Coins of all kinds is Feng Shui Jewelry. Chinese Coin Jewelry is a wonderful way to attract wealth energy to you all day long. Hung Pao or Ang Pow (Lucky Fortune Gift) are 3 Chinese coins tied together with red ribbon and placed inside a red envelope. Traditionally it is given at Chinese New Year by married couples to single couples to share the wealth of their love and prosperity. Throughout the year these packets of wealth luck carry with them strong money symbolism so it is customary to place them in your Wealth area and carry one with you in your wallet or purse. Bamboo Plants represent wealth and prosperity as well as longevity and good health. Buy your plant from a knowledgeable shop and get care instructions. Keep your plant in the Wealth area of the home or office or of any room only if that is best for the plant. As with all plants, make sure your Bamboo is healthy. If you see any signs of poor health remove the plant immediately and put it outside for disposal. Sick plants will only rob you of wealth energy. Chinese Gold Ingots represents money coming to you. In Feng Shui, the Gold Ingot symbolizes actual gold bullion used in ancient China as large currency. The Chinese Gold Ingot is a Traditional Feng Shui Cure and Chinese New Year prosperity symbol. Ingots are often in the hands of Buddha, under Feng Shui Turtles and Frogs, in Feng Shui Hangers and sold separately. However displayed, they enhance your wealth. Dragons bring you wealth energy, but they do something much more important for you. Dragons symbolize your power to control situations and your own life, especially economic issues. So Dragons give you the power to take control of your money problems. 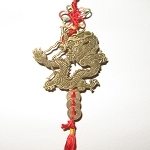 You will often find Dragons as figurines, bells, hangers, and Feng Shui Jewelry. Lucky Cats symbolize wealth. The Lucky Cat with its right paw raised brings money and happiness to both homes and businesses. 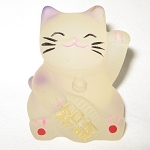 The Lucky Cat with its left paw raised attracts customers to businesses, stores, or offices by waving new patrons into the store or waving to the clients to do business with the company. Profits will be the end result. When both arms are up, money, happiness, and customers are all attracted to either homes or businesses. Ho Tai Buddha (the chubby, happy, laughing Buddha) are symbols of good luck and great fortune. They are usually found with additional money symbols on the statues. Sometimes you will find them sitting on a huge gold ingot or dancing on a money bag. The large ingot and the money bag both represent greater wealth and abundance. They usually have large earlobes, which also symbolize wealth. Most of these items can be placed in the Feng Shui Wealth and Prosperity area (when looking in from the front door it is the back left corner of any home or room.) Always follow the placement instructions that come with the items when you purchase them.